The Church always needs men who offer their lives in service to God and his Church. If accepted by the Vocations Director and Bishop for Training, these men are eventually ordained – they receive Holy Orders. 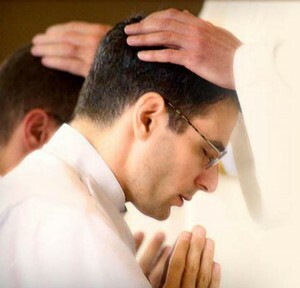 Do you think you might have a vocation to the Priesthood? It is important that one of the first people you speak to is your parish priest. It is always good to speak to your parish priest about the possibility of vocation if you think that is what you are being called to. Your parish priest also has contact with the Diocesan Vocations Director and it is usual that in the period of discernment before being accepted, you will need to meet with the Vocations Director several times before he puts you forward for selection process for training. In our Diocese we also have a Vocations Discernment Group that meets regularly. Your Parish Priest should be able to get the details for those meetings is you do not already have them. The Diocese also has a programme for the training and ordination of men to the Permanent Diaconate. This is a special ancient ministry, whereby men are ordained as deacons, even though they might also have a normal daily job as well as a family. There is a section about this on our Diocesan Website, but once again, this is something that it is important to talk to your parish priest about. Holy Orders are a special ministry – literally meaning service – that many Catholics are called to. One of the Pope’s most ancient titles is ‘servant of the servants of God’. Here is the moment when the election of Pope Benedict XVI was announced in Rome amid scenes of great joy.